WWE Women's Champion Becky Lynch recently talked with ESPN on her triumphant win at The Show of Shows. Lynch stated that her extremely hectic WrestleMania schedule didn't give her enough time to soak it all in. Becky Lynch turned heel on her former friend Charlotte Flair at last year's SummerSlam. This moment ended up being a decisive one for the Irish Lasskicker, as she began getting loud fan reaction on a regular basis. Her injury on the go home show of Raw before Survivor Series and her eventual exclusion from the PPV led to the WWE Universe completely getting behind her, with Becky now being called "The Man". At WrestleMania, Lynch became the Women's Champion of both brands after defeating Ronda Rousey and Charlotte Flair in a 'Winner Take All' match. It's no secret that WWE Superstars work through a very demanding schedule. It gets even harder come WrestleMania season when the entirety of the wrestling world has its eyes set upon these larger than life artists of the squared circle. 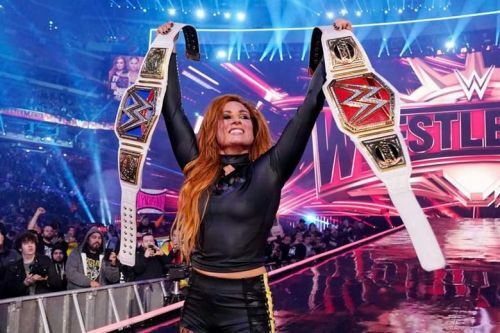 Becky Lynch was in the main event of WrestleMania 35, and her schedule wasn't any different. Match preparation, media obligations, plus the Raw and SmackDown episodes after 'Mania made sure that Becky wouldn't get enough time to process her victory. Got out of the building at 2 am, got to the hotel at 3, in bed by 3:30, up at 5, so no, I haven't really had time to sit and think about it. I will, but today I go back to work. We'll do some work, and then we'll think about it on Wednesday over a couple of tequilas, and maybe a cauliflower pizza. Becky Lynch is currently involved in an angle with the Lady of WWE, Lacey Evans, and has been exchanging Twitter insults with The Southern Belle ever since the feud kicked off. What are your thoughts on Lynch's win at 'Mania?